Known in antiquity as the Land of a Million Elephants, Laos is one of the most authentic and less touristy destinations in Southeast Asia. Lacking a coastline, the meandering Mekong River, one of the most emblematic of the planet, is of great importance and marks a natural border with its neighboring countries. Its inhabitants preserve much of their traditions and receive tourists with great curiosity and kindness. 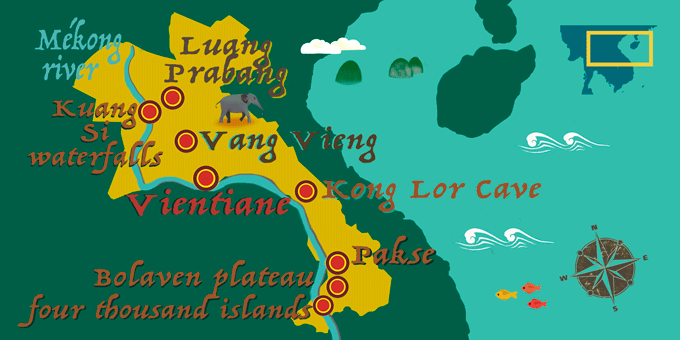 a vacation package to Laos offers everything to the visitor: beautiful cities with monuments endowed with an exotic architecture, footpaths, waterfalls and more waterfalls, steep cliffs of limestone, caves and underground rivers, cozy villages, diverse ethnic groups, jungles, zip lines, coffee plantations and rice paddies. The natural wealth of this small and charming country makes it one of the most beautiful in the world and a paradise for ecotourists.